« Circus Camp April 9-13, 2018! We are taking the party to the streets, and we want you to come with us! The South Peace Community Arts Council is excited to be organizing the fourth annual Multicultural Fusion Festival! 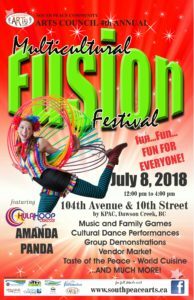 This year the festival will be held on July 8th, 2018, from 12-4pm, on 104th avenue in the heart of downtown Dawson Creek. With vendors lining the sidewalks, a temporary stage, and roaming street performers, this year’s festival will be a real walk in the… well, street! The Multicultural Fusion Festival is a joyous celebration of the many different cultures and talents represented in our community and region. 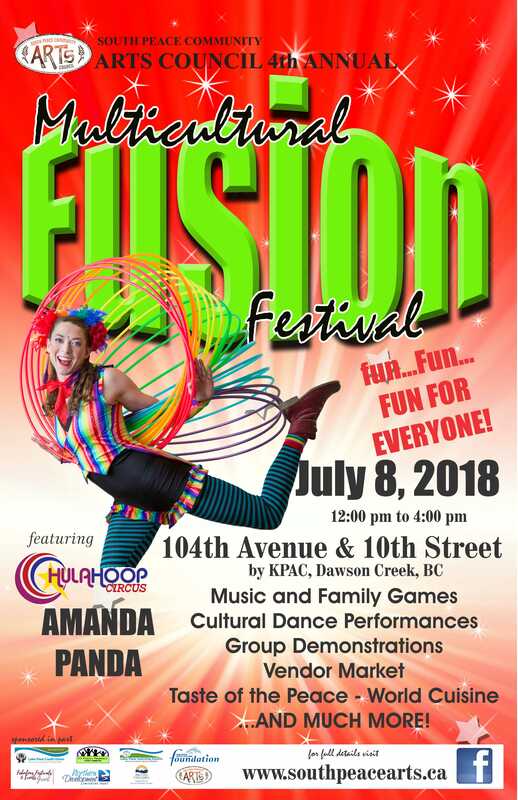 The festival features street performers, music and cultural dance performances, group demonstrations, family games, ethnic foods, a market area, and more! With thanks to our wonderful sponsors!